In lieu of anything new of my own to show you, I am going back to basics and showing one of my favourite inspiration pieces ever. I’ve never seen this actual item in the flesh. 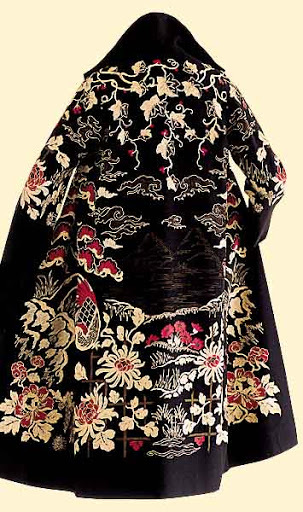 This one is from The Kyoto Costume Institute (although there may well be another elsewhere). It’s by Paul Poiret whom I have mentioned the odd time before. I am totally besotted with his work and only wish I could have seen this exhibition, but rest assured the book is on my Christmas list. Poiret is of course not to be confused with Poirot, although it’s well known that I have a soft spot for a twirly moustache (and was informed of a sighting on Leeds station just this morning). One day – maybe this winter – I’ll get round to making a fablous hand-constructed coat embellished with gathers and puckers and pleats and who knows what. Realistically, it’s not going to be this winter. I’ve got a book to write. I hope I’ll have the contract in my hands in the next week so I can gush all about it, but as yet, it remains under (embellished organic cotton) wraps. Are you excited? I am! I’ve also just taken on a sizeable freelance project which will involve coming up with lots of fun classroom ideas for using a collection of paintings and other artworks. I’m looking forward to stretching my brain in a different direction again. It’s been a while since I wrote teaching resources for museums, and now I’m doing them with my artist hat on, as well as my museum education officer hat. Hmm. Two hats. I like that. I’m working with a friend of mine, a very fine poet who also has a bit of a thing for fashion, so there might well be a few frocks appearing in there…. Speaking of frocks, I am pondering design ideas for a new dress for a wedding next March. I’ve already got the fabric, through a minor disaster. I was thinking Regency style, but this has just caught my eye and might be taking me off in a totally new dress-direction. Just one final note to say hello to all the new visitors who have travelled here via Strange Fragments and dear ada. Lovely write-ups like this really make my day, thanks! What a delight to find your blog! Your work and inspriations are wonderful! I adore Poirot as well… Dreamy jacket! The Poiret exhibition was *fantastic*! I’m sure you’ll love the book.